The story of Kusum is not one of a kind, and unlike hers, most of these stories don’t end well. The brave ones like her who venture out from their villages in search of better opportunities encounter heavy-duty steel barriers to success, not to mention unscrupulous “agents” and extended family members. Only a small portion of rural population completes primary education; the quality of education is often dismal. Without a high-school certificate, the majority of students are no better off in the labor market especially given that many are unable to read and do simple arithmetic (Read more here). Rural workers bring very limited/outdated skill sets, which are inadequate in bigger cities where technology as simple as a food processor is part of middle class life, but a new struggle for a villager. Most villagers have not even seen a washing machine or an oven, let alone computers and laptops. Most unskilled and semi-skilled workers in India find their way into the informal sector either through word-of-mouth or through intermediaries. These agents, sub- contractors and contractors are all too often shady informal businesses run by individuals with commercial exploitative objectives alone. Adding to this, villagers also have to deal with uncertainties due to lingual differences, absence of medical and financial support and lack of stringent labor laws. 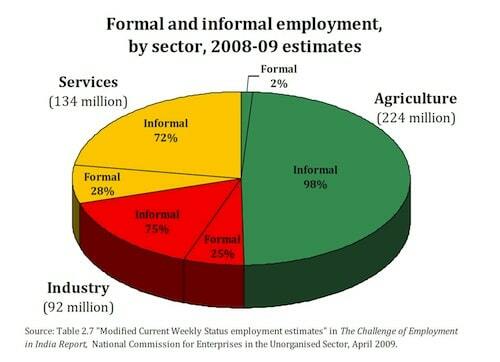 A quick look at the chart shows that 50% of the employment is in Services and Industry, of which more than 70% is in the informal/unorganized sector. Clearly the informal Sector dominates employment in India and majority of these jobs are filled by semiskilled or unskilled labor from rural areas. These informal jobs do not secure minimum wages, annual leave or any kinds of benefits. Rural migrants can end up living on the sidewalk, under highways or bridges or occupying over crowded slums. Due to no choice of their own, they become rag pickers, hawkers or underpaid construction workers. Yet, these jobs are their only means to climb out of poverty. Now let’s look at the other side. India’s growth rate is around 7% and is mostly metro centric. These growth centers are experiencing severe shortage of labor specifically in the unorganized/informal sector. In fact, according to estimates by ICRA Management Consulting Services, by 2020 India’s construction industry will need 33 million more skilled crane operators, electricians, welders, masons and so on; the textiles and clothing industry will need 26 million loom and sewing machine operators; and the automobile and auto parts manufacturing industries will need 35 million machinists, mechanics, salesmen, etc. A regulated, transparent and ethical avenue to connect the informal unskilled or semi-skilled job seekers and the employers. As the first step, The Indian government announced the formation of the National Skill Development Corporation (NSDC) with the objective of skilling / upskilling 500 million people in India by 2022. It plans to achieve this mainly by fostering private sector initiatives in skill development programs and by providing funding. New startups like Bodhicrew, v-sheshM, and others have come up, with their focus on the entire value chain. Not only do they provide skills development training, but also form the much-needed transparent connection that ensures justice to both the employment seeker and the employees. They use a mix of technologies such as the Internet (e.g. interactive websites in multiple languages), mobile (e.g. SMS alerts) and call centers to reach remote villages. They provide access to job specific skill training and ensure placements that guarantee minimum wages, fair treatment, annual leaves, etc. To add to this they also provide services like candidate verification and background checks to further maintain the integrity of both parties. The opportunities for the private sector to enter this space are far from being exhausted. Unitus Ventures (formerly Unitus Seed Fund) is actively seeking entrepreneurs across India who has plans for scalable and affordable services in this space. It is time to give rural India a fighting chance.